The ANIC-4Ku is an intelligent, cost-effective, 4-port GE adapter/NIC designed to enhance the most demanding network monitoring and security applications by offloading the host CPU from various processor intensive tasks. The adapter is plugged into an available PCIe slot and seamlessly integrated with the host application via a software API. 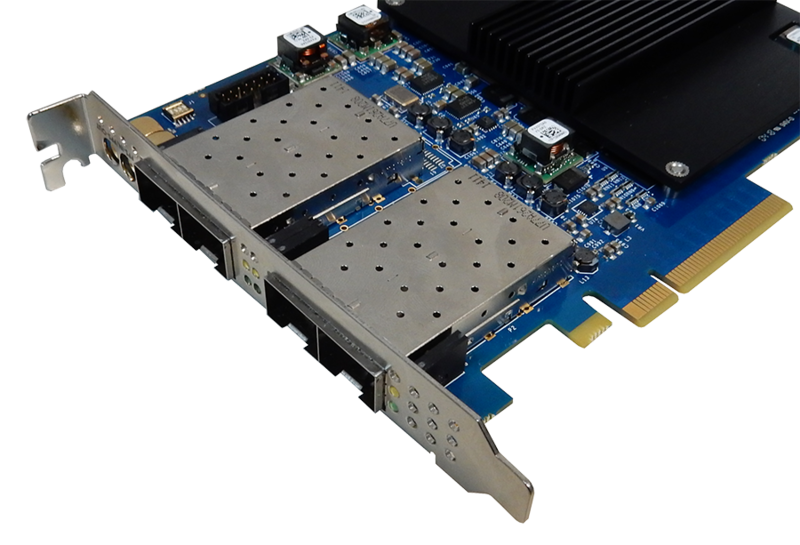 The adapter features four SFP interfaces which can accommodate SR and LR optical modules as well as copper for up to 4 Gbps lossless packet capture. Packets enter the ANIC-4Ku via the SFP ports and are processed by the onboard FPGA, which performs application critical CPU offload functions such as 100% packet capture, precise timestamping (5.7ns precision), flow classiffcation, flow shunting, packet merging (in timestamp order), tunnel decapsulation (e.g. VLAN, MPLS, GRE, GTP, VXLAN), packet slicing, packet filtering, deduplication, packet steering, direct memory access (DMA)— including multi-core DMA—and more. Packets enter the ANIC-4Ku via the SFP ports and are processed by the onboard FPGA, which performs application critical CPU offload functions such as 100% packet capture, precise timestamping (5.7ns precision), flow classification, flow shunting, packet merging (in timestamp order), tunnel decapsulation (e.g. VLAN, MPLS, GRE, GTP, VXLAN), packet slicing, packet filtering, deduplication, packet steering, direct memory access (DMA) – including multi-core DMA – and more.